Excellent quality cricket scorebox. The scorefascia is smooth exterior fibreboard finished matt black with all telegraph numbers attached to swivel boards for internal operation. 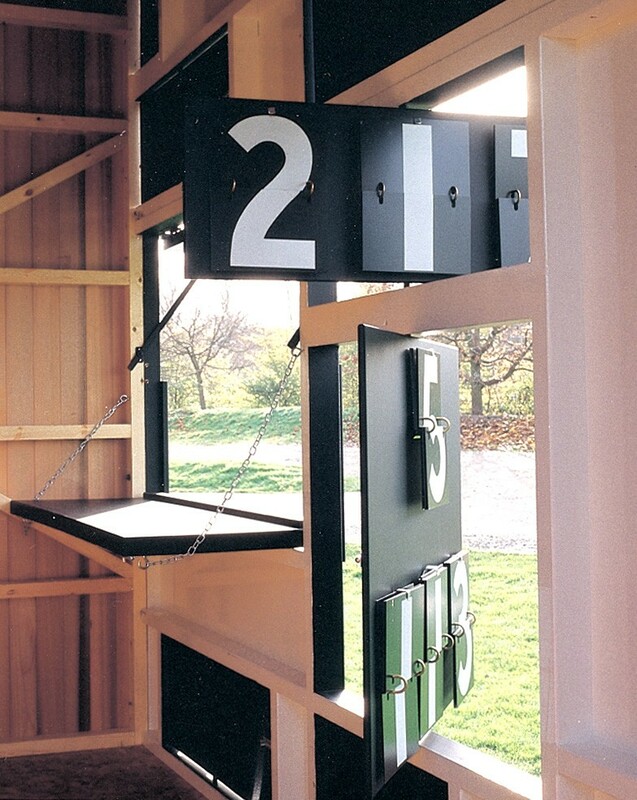 Clad in exterior plywood finished in textured paint, the scorebox has a two-scorer hatch, which splits outwards to form an awning and inwards to make a scorers' desk. The mono-pitched roof is covered with flowcoat fibreglass and the floor is strong timber. Timber security shutters cover the numbers when not in use. Information shown consists of Total, Overs, Wkts, Last Man and Home/Visitors. Dimensions: 3.36m long x 1.73m deep x 2.44m high at the front and 2.13m high at the back. Door at one end. 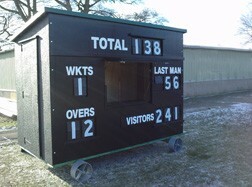 Please note the image shows the scorebox fitted to special galvanised steel wheels, which are an optional extra if you do not wish to fix your scorebox down to a prepared base.